GORDONVILLE — There is a magic number, representing a harsh reality, hanging in the air at Eagles’ training camp. Out of 90 hopefuls, only 53 can make the active roster. That can be a lot or a little, depending on how one looks at it. The reality is that the bare minimum comes in at a much lower head count. On offense – with three quarterbacks, three running backs, two tight ends, four receivers and eight offensive linemen – you have 19 spots. Going the other way, in a 3-4 base defense – with six defensive linemen, six linebackers, four corners and three safeties – you have 19 more. Add in three specialists – kicker, punter and long snapper – the total is 41. The other 12 spots can be filled as coach Chip Kelly and his coaching staff, perhaps with input from general manager Howie Roseman and others in the front office mindful of contracts and salary-cap hits, sees fit. The option is there to go heavy at certain positions – but not all – creating the need for versatility (i.e. offensive and defensive linemen who can multiple spots). In some cases, it will come down to need, whether that relates to the system or the health of locked-in starters. But, in most scenarios, it is about the dozen out of the remaining 59 players stepping up and becoming difficult to axe. The process began with OTAs, continued with pads on in training camp and shifts into high gear with preseason games (the first test is Friday in Chicago against the Bears). For those of you who bemoan preseason games, saying there is nothing to watch and that you just hope the key players emerge unscathed, you are probably not looking hard enough. Quarterback (3): The locks are starter Nick Foles, likely No. 2 Mark Sanchez and second-year man Matt Barkley. That would leave G.J. Kinne on the outside looking in, but the Tulsa product is a well-liked team guy and could be kept on the practice squad with an eye toward being the future No. 3 a year from now when Sanchez moves on and Barkley moves up as Foles’ backup. At the least, Kinne will get enough snaps early in the preseason to audition for other teams not as well-stocked. Running Back (3 or 4): The locks are reigning rushing champion LeSean McCoy, utility back Darren Sproles and Chris Polk. Kelly would be rolling the dice by sticking with three running backs, but it could be done. He proclaimed that Matthew Tucker, who propelled himself into a paycheck last year with a strong camp as an undrafted rookie out of TCU, is reportedly entrenched as the No. 4. They have two undrafted backs of note in Henry Josey (Missouri) and David Fluellen (Toledo). Josey, who had a horrific knee injury in college and returned to have a solid year, could probably be slipped onto IR while Fluellen could slide to the practice squad. That would keep continuity for next year’s camp, but they would have to show enough to earn the investment. Either that, or one or the other could wrest the job from Tucker, assuming Kelly decides to keep four running backs. Wide Receiver (5 or 6): This one bears watching, even with four spots nailed down by starters Riley Cooper (left) and Jeremy Maclin and rookies Jordan Matthews (second round) and Josh Huff (third). Matthews has been the talk of camp, and Huff played for Kelly at Oregon and was tabbed a round or two higher in the draft because of that gateway. With Sproles in the mix, and second-year tight end Zach Ertz almost like a glorified slot receiver, there is really not a compelling need to go beyond five pairs of hands. For those who dig redemption stories of redemption, there is Arrelious Benn. He’s 25 and former second-round pick of Tampa Bay, but has missed 27 games – including all of last year – with a laundry list of serious injuries (two knee surgeries, concussion, etc). Much will depend on who lands the wide-open return job(s). Brad Smith and Damaris Johnson are both experienced NFL return men, but Kelly has already stated that both Matthews and Huff will get looks. Part of the decision may depend on Sproles, who was once a feared return man. Sproles broke the Eagles’ back with kick return in the playoffs last year, but his overall numbers in New Orleans last year pretty much mirror the pedestrian per-return stats posted by Johnson (although his decision-making is better). Smith, a college quarterback and NFL veteran signed late last season, brings versatility that includes a locker room presence and special teams prowess. It would seem that he, or Oregon product Jeff Maehl, would be who Kelly would secretly like to see step out and shine. Maehl, along with Cooper, has spent training camp on the sidelines in a walking boot. That has opened the door for 6-7 project Ifeanyi Momah, and former Miami draft pick B.J. Cunningham, whose off-and-on fringe affiliation with the Eagles dates back to the prior coaching staff, to recently taking first-team reps in Cooper’s stead. Tight End (2 or 3): Brent Celek entered the league as a fifth-round pick who had receiving skills but couldn’t block his own shadow. To his credit, he is now more of a blocker than receiver, with the aforementioned Ertz expected to give opposing defenses match-up fits. Is anyone else needed? James Casey had just three catches last year, but did lead the team in solo special teams tackles. He is also the closest thing the Eagles have to a fullback and, like Smith, is a quality veteran on a young team. 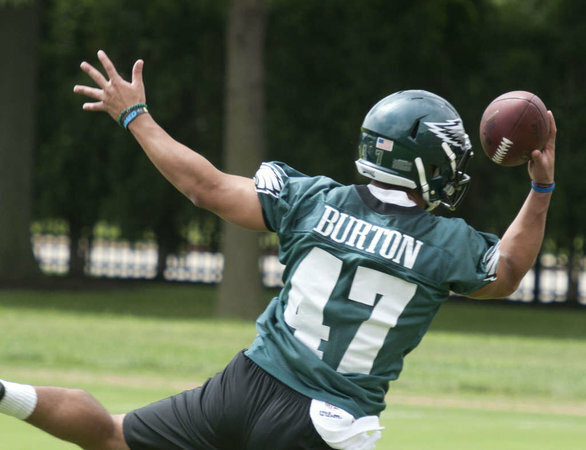 A player to watch is Trey Burton, an undrafted and versatile rookie out of Florida. While he may not make the roster, Burton could intrigue the staff enough to warrant a year on the practice squad to add bulk and take Casey’s place a year from now. Offensive Line (9 or 10): This sound unit was thrown into disarray by the four-game suspension levied against second-year right tackle Lane Johnson for using a banned substance. For the time being, Alan Barbre has been plugged in at right tackle and the rest of the line – the Pro-Bowl left side of tackle Jason Peters and guard Evan Mathis, center Jason Kelce and right guard Todd Herremans – remains intact. Johnson, who can stay through the preseason but can’t return to the team until after the fourth game and won’t count against the 53-man roster until then, has been working with the second unit. He likely won’t start until after the bye week, which is after six games. Matters are further complicated by backup center Julian Vandervelde’s lingering back issues, which could open the door for journeyman David Molk, who has drawn some praise from the coaches. Second-year tackle Matt Tobin, who made the roster last summer as an undrafted rookie, is likely safe. Others in the mix are Dennis Kelly, who started nine games at tackle as a rookie two years ago but was not activated at all last season, and journeyman Andrew Gardner. Kelly has been working at guard, next to Johnson, which may or not help his stock. It depends whether the coaches can envision the tough-but-slow Kelly as a viable option at tackle in this break-neck system or if his only shot is as a guard. Some undrafted rookies – namely tackle Kevin Graf out of USC – have made early impressions as well, meaning that the attempts to make 6-8 and 340-pound Mike Bamiro into an NFL player could be chalked up to a well-meaning experiment gone awry. Defensive Line (6, 7 or 8): This is where the ripple effect of other positions, such as receiver and offensive line, can be felt. Defensive ends Fletcher Cox and Cedric Thornton, along with returning nose tackle Bennie Logan, are locks. Word is that former second-round pick Vinny Curry, despite being more of a natural 4-3 end, has added bulk to his frame and is ready to be more than just an option on passing downs. Fifth-round pick Taylor Hart, another Oregon product who got his Duck on for defensive line coach Jerry Azzinaro, would have to play himself out of job as a reserve defensive end (with some capability to also line up over the nose on obvious passing downs). Aside from Matthews on the offensive side of the ball, rookie nose tackle Beau Allen – a seventh-round pick from Wisconsin – has been earning the most positive headlines among the rookies at training camp. The above group – the three returning starters, two rookies and Curry – provides six young and ascending linemen. How many jobs are left? There is Damion Square, who made it as an undrafted rookie last year out of Alabama. Square found himself as the backup nose tackle, despite being undersized (south of 300 pounds, which is virtually unheard of for the position). He has NFL ability but might be better suited as a backup tackle in a 4-3 scheme. This would seem like a position they could go short on, staying at six, unless a player on the bubble steps up. In this context, keep an eye out for second-year ends Joe Kruger and Brandon Bair. Kruger was a seventh-round pick last year but spend the season on IR. Bair – from, you got it, Oregon – is sort of like the Kinne of the defense. Nobody is more in his corner than the coaches. Where does that leave Alejandro Villanueva, the war hero looking for a Vince Papale-like storyline? They owe him a spot on the practice squad, if he wants it. Problem is, with so many young linemen in the mix, there is no guarantee of a job opening in the future. Linebacker (8 or 9): Locked in are the starters, Connor Barwin and Trent Cole (left) on the outside and the heart of the defense on the inside, with spiritual leader DeMeco Ryans and emerging star Mychal Kendricks. The backup jobs are where it gets interesting. First-rounder Marcus Smith, though a project, makes it five linebackers. With the need to improve kick coverage, Bryan Braman has a job all but secured. The question would be if they are comfortable with either Smith or Braman being the next up if there were an injury. If not them, then who? Former first-round pick Brandon Graham, who is a 4-3 end trapped in a system forcing him to be an OLB? Untested but intriguing second-year man Travis Long? Logic would dictate Long or Graham make the team, but not both. Graham has more experience, but Long makes less money and is probably a more willing special teamer. Assuming they end up keeping five outside linebackers – with neither Smith nor Braman really options to do more than finish up a game out of necessity – what do they do at backup inside linebacker? Kelly singled that out as a spot of need heading into the draft. They came out the other end without anyone new. Of the holdovers, it would seem Najee Goode, who was picked up on waivers last season from Tampa Bay and actually started a game, has the early edge over Casey Matthews, Emmanuel Acho and Jason Phillips. All but Acho can play some outside linebacker, if needed, and are above-average special teams players. Don’t be surprised if a veteran cut loose from another team later in the preseason is added to the mix here, making any and all of the middling group of inside linebacker candidates expendable. Secondary (8, 9, or 10): Ideally, with the league the way it is now, you can never have too many defensive backs. Five corners and five safeties would be a defensive coordinator’s dream. But, there is reality to consider. Ten could be a luxury, and probably will be with this group. The corners are set with Cary Williams, Bradley Fletcher and Nolan Carroll on the outside and Brandon Boykin manning the nickel. Also worth watching is how much of a chance Carroll and/or Boykin get at return jobs, which could affect how many receivers stick. Curtis Marsh is finally “getting it,” and having a good camp, but that might only be enough to land him a job elsewhere. Fourth-round pick Jaylen Watkins, provides the versatility of playing corner – outside and slot – and safety. Watkins’ versatility, combined with his special teams prowess, might take a job away from a fifth pure safety. Behind Malcolm Jenkins, the gem of the free agent class, there is the ongoing battle between Earl Wolff and Nate Allen to start beside him. Behind them are fifth-round pick Ed Reynolds, who was heralded a steal but has reportedly taken some lumps in camp, and special-teams ace Chris Maragos. Add in rookie free agent Daytowion Lowe and second-year man Keelan Johnson, who is facing some legal issues back in Arizona, and this position is one of the more hotly contested in training camp. It would seem that if Wolff beats Allen cleanly for the starting job, Allen’s lack of special teams experience could put him on the unemployment line, but that remains a big “if,” given Wolff’s inability to stay healthy. Specialists (3): Easy. Alex Henery is likely to remain the kicker. Punter Donnie Jones and snapper Jon Dorenbos do not even have token competition in camp. We started off with 41, with 12 jobs up for grabs. Counting the high-end projections at each spot, we have 56. That’s three over the maximum (four, if Lane Johnson’s spot is filled until he returns, which is not a guarantee). Sometimes these things work themselves out with injuries. Other times, hard decisions have to be made. For Eagles Nation, the hope is that the decisions are the right ones. This entry was posted in Sports on August 6, 2014 by gordonglantz.